Like so many disasters in life, people think a home fire will never happen to them, it only happens to someone else, right? So it’s shocking when it does happen to them and they discover that it could have been prevented or they weren’t prepared when it did happen. 7 people, mostly children and elderly adults, die daily from home fires. 36 people receive injuries daily from home fires. There is approximately $7,000,000,000 (7 billion, that’s a lot of zeroes) worth of damage that occurs each year from home fires. 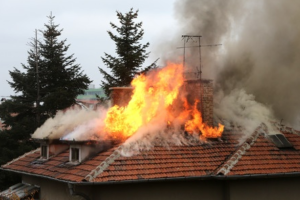 As you prepare your home and your family to help in preventing a home fire, you should be aware that it has been established that the leading causes of home fires and injuries are cooking equipment, electrical problems, candles, unsupervised children playing with fire and smoking. Be sure you have working fire detectors installed and maintained, both smoke alarms and carbon monoxide alarms. Have working and maintained fire extinguishers available in at least 2 or 3 convenient places. (See the video below demonstrating how to use one). Keep loose clothing, and all other combustibles away from the stovetop. Never leave the kitchen when you are in the process of boiling, frying or broiling food. If the fire is small enough, using an oven mitt, and cover the pan with a lid. Turn the stove off, leaving the pan covered until it’s totally cooled. Don’t leave young children unattended in the kitchen while there is food on the stove. 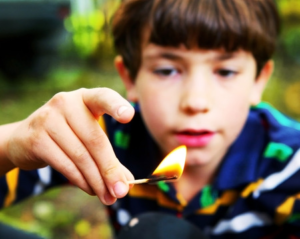 Keep all matches, cigarette lighters, and other lighting devices up and unavailable to children. Be a good example for your kids, and don’t play with fire…they love to imitate adults. Never leave space heaters running unattended. If your home has baseboard heaters, make sure there is at least 12 inches between them and any furniture, curtains or area rugs. Make sure your fireplace is covered by a metal screen, and that you keep it cleaned out. Use power strips whenever possible instead of extension cords. If you need to use extension cords, don’t run them under rugs or across door thresholds. Keep small appliances unplugged when not in use. Have an escape plan, and hold fire drills periodically. Here is a great Home Fire Evacuation plan from the Seattle Fire Department, and a Home Fire Safety checklist from the National Safety Council. City of Seattle – Fire Extinguishers from Video Unit on Vimeo. For all of your Insurance questions or needs, Contact Whitcomb Insurance, we’d be happy to talk to you about your Homeowner’s Policy and make sure you have the right coverage.